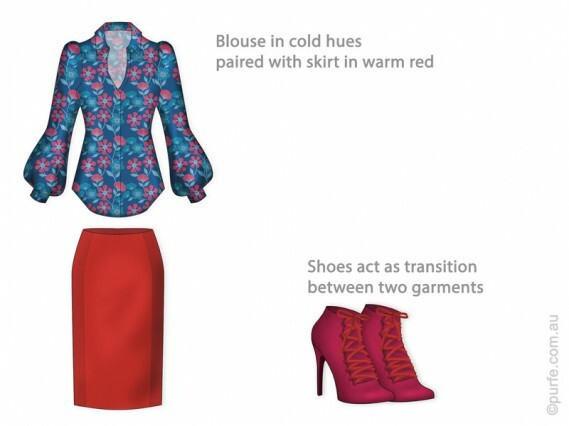 One of the most frequent problems in creating contrast in an outfit is putting together garments with no obvious connections. Items with opposite characteristics placed next to each other often produce excessive contrast which can not only be bold and unflattering but also disintegrate the outfit’s composition. For example, neon-green chiffon skirt and lemon yellow bulky jumper quite seldom will be a part of a balanced look on their own. When an outfit consists of unrelated and disjoint colours, textures or patterns, to unify them it’s essential to make a “bridge”, create an intermediary. Its purpose is to strengthen the connection between garments and create complete story. It’s predictable that to be effective this “bridge” item requires similarity with the elements which are meant to be linked. Areas of intermediary’s use are usually identical with fields of contrast. Thus, if we use two unrelated colours to create a contrast it will be logical to balance it out by another element of colour. The same is true to patterns or textures. Let’s go into details for each of them. Colour is the most usual area for applying an intermediary. Colour temperature. It is popular opinion mentioned on many style blogs that warm and cold hues should not be used together. While I agree this is good general rule to avoid imbalance, the dots can still be connected. The harmony of two different colour temperatures could be created with an intermediate that will tie the opposites. A brief example can be seen in the sketch below. 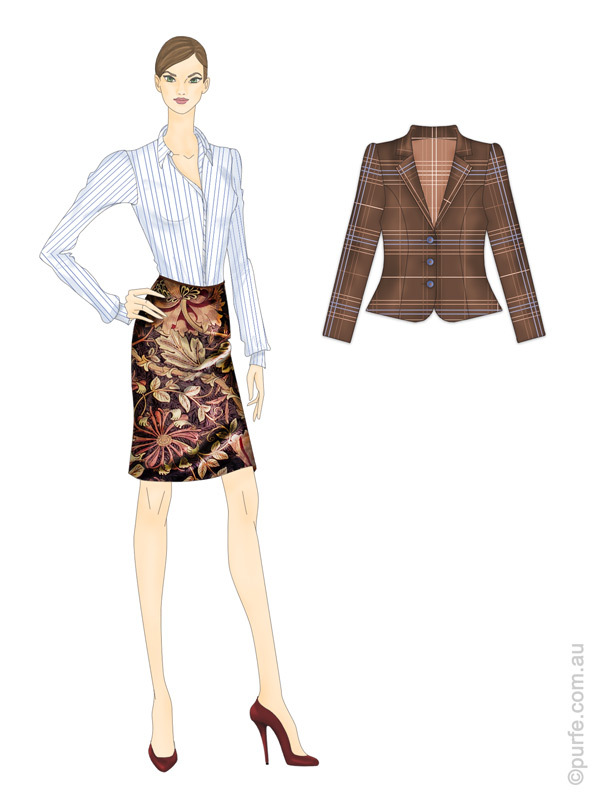 The top and the skirt are from different colour families – cold and warm. Together they look discordant and even conflicting. It is obvious that a link is needed. By bringing in shoes that support the pattern of the top and skirt’s hue the puzzle is solved and outfit regains its lost harmony. Hue. 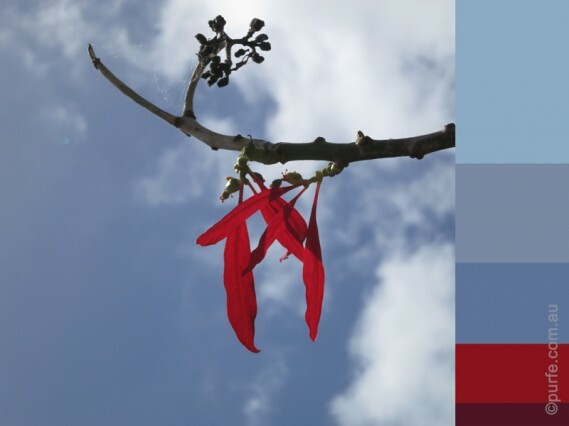 In the case of hue the contrast is usually created by complementary colours. They are opposite on the colour wheel, therefore have nothing in common. Placed next to each other they produce maximum vibrancy and contrast. Adding the intermediary softens the contrast and creates a perceptual bridge between two colours. 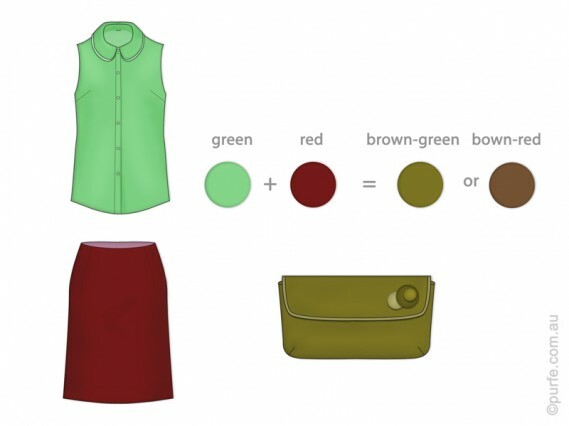 For example red and green could be linked by brown-red or brown-green as they are the exactly colours that will come out if red and green are mixed. Colour brightness. Too much difference in brightness can cause undesirable dramatic contrast. Employing in-between shades can help soften the look. In the picture below the top and the skirt on the left create sharp dramatic contrast which overbalances girl’s gentle complexion. Following the same trail that helped us to unite hues before, we rely on the intermediary item. Here we introduce a jacket which adds third tonal characteristic and brings the look closer to perfection. This is the second area where the intermediary could be used. Selecting in-between patterns requires a bit more sartorial funds as patterns consist of many different elements meant to be coordinated. In one of my previous posts I have explained the levels of pattern mixing. Therefore, I will only touch on the topic of setting an intermediate. To improve the look’s aesthetic “bridge” patterns should resemble those already in use. Similarity could be either in style of lines, chromatic characteristics, or other levels of pattern coherence. For example, if we combine geometric print with intricate abstract design linking pattern might remotely resemble both of them. As I have mentioned before there are no common rules for texture mixing. However, the transition textures are expected to have similar attributes to those already in use. Shapes and volumes seldom require an intermediary. This means, as long as common sense is taking into account, it is difficult to make mistakes in this area. As you have already noticed the process of “linking” parts of an outfit is not a subject for sweeping generalizations. It is not easy to set strict rules and provide common instructions to follow. All I can do is to outline the problem and set trend of thoughts. The rest is entirely up to you. I’m sure, if a person knows about relations between elements described in this article they will tend to pay a little more attention to the sophisticated ritual of dressing. That will certainly produce noticeable and pleasant changes. While putting an outfit we aim to create a composition where all details are in their place and the whole look is complete and pleasant to the eye. There are a number of subjects to keep in mind when arranging a composition. The important one that I would like to talk about here is contrast. The abstract idea of contrast is one of the fundamental principles of our Universe. Mountains and plains, oceans and dry lands, positive and negative charges, high and low pressure – they are all contrasting in their state or force, and it is through this interaction the word exists. Recognising contrast is natural for humans. We differentiate objects because they are contrasting , we use this difference as a reference point. For example, Eiffel tower (300m high) is quite lofty for an average human, but it is dwarfed by Burj Khalifa building (828m) in Dubai when two are put together. Back to the subject of clothing. Being curious human beings it is our second nature to look for new experiences. A visually interesting item in this regard would be something that induces our eyes to explore or as Diane Vreeland put it: “The eye has to travel”. Introducing layers of complexity into the look by adding various textures or using multiple colours gets our attention. Put it another way, contrast is used to enhance an outfit by giving tedium an appeal, a life buoy, reducing the repetitive impact. Colour. The same colour can look different depending on surroundings. It could be vibrant and bright next to complementary hue, or become subtle and dull whilst surrounded by analogous colours. Brightness is our perception of the colour luminance, how bright we see it. It is quite an interesting topic on itself, but I’ll explain it briefly below. Ideally the difference of brightness in an outfit should be in direct relationships with wearers’ complexion. What I refer to here is the natural contrast created by skin, eyes, and hair tones. The more contrasting features woman has the wider brightness range in garments she could afford to wear. And on the contrary, the less contrasting appearance demands for the lower brightness contrast in clothes. Back in the real world, the illustration below shows outfits made in contrasting colours. 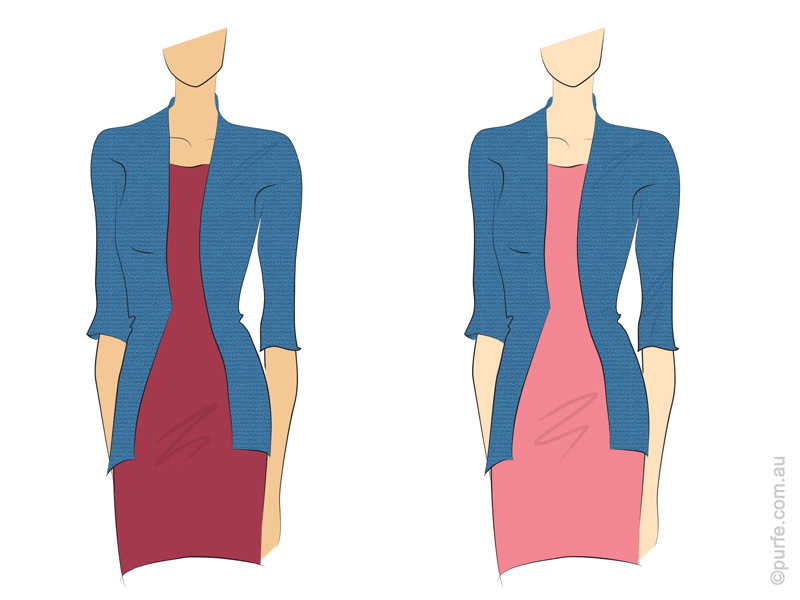 The sangria and blue dress on the left have low brightness contrast while the pink one at the right is much lighter than the jacket and so it will do great on person with high contrast complexion. Shape (volume). Arrangements of shapes that are slightly varied and irregular tend to hold the interest of a viewer longer than those perfectly even. Different forms can not only produce different moods but can also create an optical illusion. Anything will look bigger surrounded by smaller objects. And vice versa. For example big bag would appear even bigger if it is carried by a petite girl. Or, speaking about moods, imagine fitted stiff coat with bulky scarf thrown upon it. Strict lines of a coat are perfectly unbalanced by the casual style of the scarf. Texture. Creating contrast in textures is a great way to add an extra bit of interest and an elegant way show sartorial consciousness. It is a must for monochrome outfits. Whilst lacking the colour component the certain degree of excitement could be, nevertheless, created by using surface properties. The simplest way to make texture contrast is to use fabrics with straight opposite characteristics: glossy – matt, sheer – opaque, stretchy – firm and so on. There is, unfortunately, no proven recipe book on how to mix multiple textures. Some experimentation and observation of what works is a way to go here. Various textures reflect light differently. Nap fabrics (like velvet, fleece and felt) make colours appear more rich and saturated because of their fuzzy surface. In contrary, smooth and shiny ones reflect more light. That creates gloss and bleaches the surface. Therefore, the same colour in silk will appear lighter than on velvet. Moreover, fabrics hold dyes differently. The colour on cotton gabardine will look a little bit lighter than on wool as wool tends to retain dye better. Even though lack of variety can be tedious, contrast should be used with care. Too much of it and there will be several focal points competing for an attention and affecting unity of the overall look. As you can see contrast is the ultimate attention grabber. It can work on many levels and is to be used with comprehension taking into account person’s style and personality. How often while putting together the outfit do you limit your use of colour to just a few or rely on neutral hues only? We all know that choosing colour palette for an outfit could be a time consuming process. A lot of heroic attempts to conquer the colour reel end up going back to a simple traditional combination or, at worst, looking like an over-decorated Christmas tree. I suppose, perfect sense of colour is possessed by relatively small amount of people, rest of us (myself included) have to content with our own sense of beauty, intuition and, at best, with some knowledge of the colour theory. 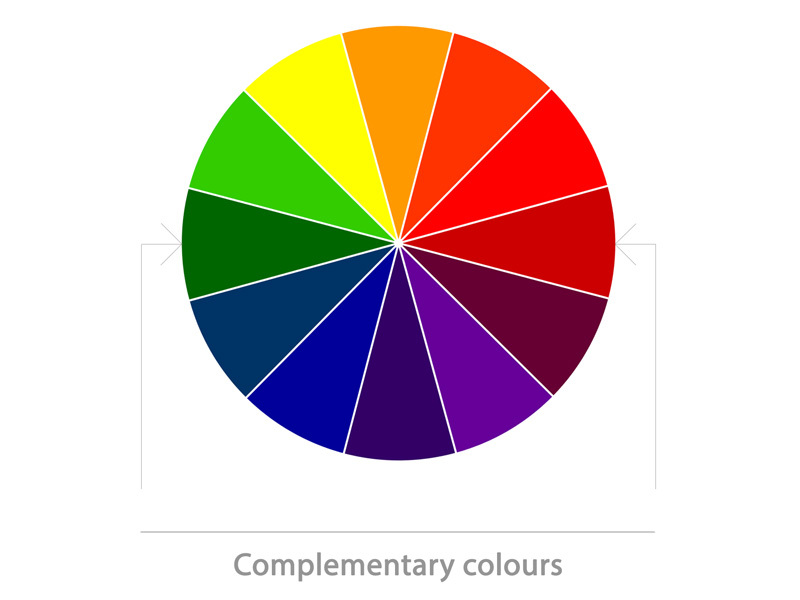 There is no doubt that understanding either consciously or unconsciously the basics of the colour theory is essential for creating a balanced set. To successfully use different hues in an outfit your own personal preferences will need to be in an agreement with certain rules. However, all these rules for creating colour schemes, hierarchy of colours, colour discords, value keys, etc. require a significant investment of time. Working with my clients I often feel a need to explain principles of colour mixing in brief, so they will be able to use it in real life. Theory itself is a bit dry and I found a good approach that is much easier and more fun. Extra bonus, it’s handy for other colouristic tasks like composing flower bouquets, choosing napkins for dining room or creating a landscape design for the backyard. It is very versatile and can be a great tool for finding unusual yet pleasant colour combinations. It is easy, intuitive and always works. Well, you‘ve got an idea, let’s get to it now. 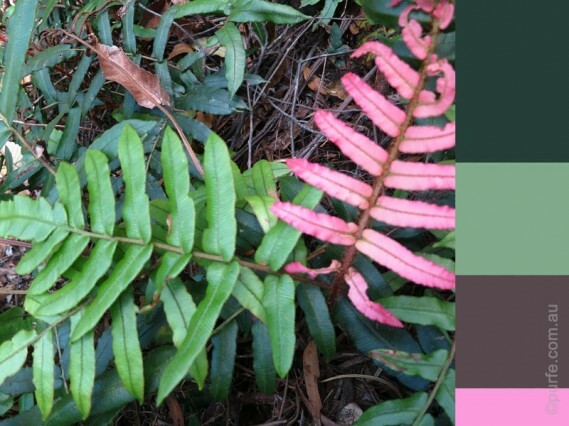 Did you know that designers quite often set up their colour palette from a single picture? We can do the same. That’s where landscape photography could be a great source of inspiration. Think of the picture as a set of colours that are combined into a single composition. Intrinsically, people tend to perceive all nature combinations as harmonious. The nature knows exactly which hues and in what proportions to use to create a masterpiece. To illustrate that, let’s take a classic sample of 2 complement colours such green and red. They are rarely used next to each other as put together they produce maximum vibrancy. However, when we see a strawberry garden patch or big flowerbed covered with red poppies it is always pleasant to the eye, isn’t it? The secret lies in proportions! Let’s get to the practical examples of how that can be used. 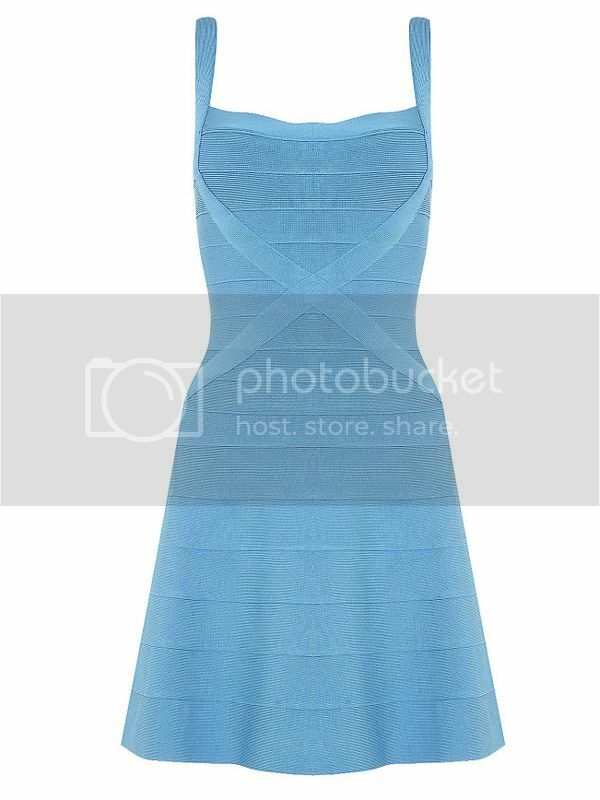 Say, we have a sky blue dress and would like to find a perfect pair to it. Now, let see if we can find something that will give us an idea of what colours could work here. While browsing my personal collection I came across a beautiful photograph of the autumn sky. It is much the same colour with the dress and is opposed by strikingly bright red leaves. Blue and red combination does not look too bright here, on the contrary, it looks well balanced. With this in mind we can start to assemble the outfit looking for reds and different shades of greys. Let’s start from very light and pale (Battleship Grey like clouds) and continue to deep grey, a tree’s branch-like colour. There is no need to use all colours in one set, just choose a few. Another example is inspired by marcescent fern foliage. Combination of green and pink is quite vernal and dynamic and might be too much for an office dress code. Paying attention to proportion, intensity and hues of mixing colours, however, we can get quiet and restrained look with subtle allusions of wearer’s energetic personality and good taste. The third set is monochrome one. It is generally assumed that putting together similar hues is the safest way to create a nice looking attire, when in fact, even a small detail, such a wrong colour temperature of one piece, can offset the whole balance. 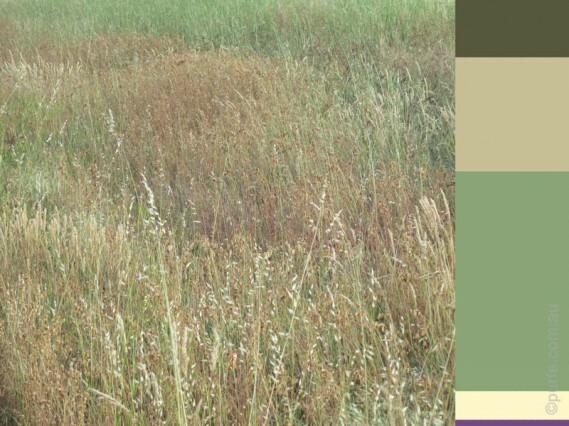 Thus, to set a mind in the right direction we will use a picture with subtle colour differences for inspiration, as the one of a summer meadow below. You can see it incorporates not only different shades of green and brownish-grey, but also tiny amounts of purple and yellow which are perfect as accent colours. This is another great benefit of analysing photos, it gives proven examples on how to use more than 3 colours, an area which usually requires experience and good knowledge of colour theory to get it all right. As you can see, you don’t need to go far for inspiration and for the tools to create a well-balanced colour palette. It’s all within a hand’s reach, be it a bouquet of wild flowers or a Google search. There are some great web-sites that can generate colour palette from images on-line. You can also search through existing palettes for inspiration and hints. My favorite one is COLOURlovers with it’s vast range of palettes and patterns. For the sake of convenience I’ll write about flared, bell-bottom, wide leg and any long pant with hemline wide enough to cover the shoe as Flared. Since they all obey the same length rules. The flared trousers and jeans are very popular among women of different ages and body types. However, according to my personal observations almost 65% of women wear flared pants which are too short, and 15% wear the ones that are too long. If there was a fine for wearing incorrect length pants the Government would’ve solved quite a few budget problems in no time! It worth mentioning that flared pants are very capricious and demanding. They can either make a whole look more slender or transform it totally opposite way. The secret to get the first and avoid the second is to hem the pants correctly. The flared pants of the correct lengths will complement almost every body type. 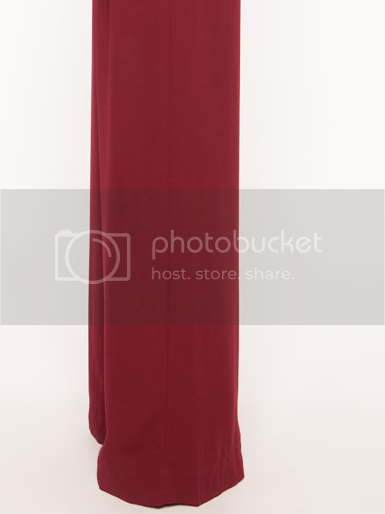 Wide hem demands long length. They are just designed that way – with lots of fabric not only broadways but lengthwise as well. The hem should almost touch the floor. It’s ok if they skim the ground. But for practical reason they can be just 0.3-0.5 cm off so they actually don’t touch the ground. 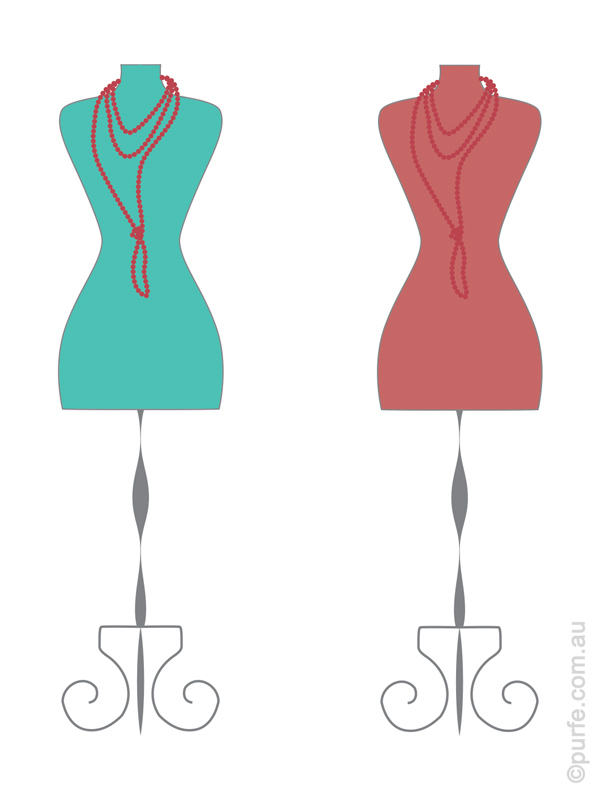 Red carpet wearers can certainly make it into exact lengths with the help of their designers. Ideally they should hide the shoe entirely. This does not mean that your stylish shoes will be out of sight. They will poke out when you’re walking or sitting down creating an intrigue for those trying to figure out what shoes you are actually wearing. If for whatever you don’t feel comfortable with this arrangement, you might as well consider some other styles to wear. “Wear it right, or don’t wear it at all” saying has its place for this type of clothing. Full length flared pants looks great with high to medium heels. Yet, hemmed for flats or low heels they get creased breaks in the front. This could be fine with denim and rough fabrics, but on most dress and suit types it does look a bit awkward. Thus, you may want to hem them at slant: longer at the back and sides and shorter at the instep. Such edge will produce a clean break in the front without compromising the length. At the same time this is more laborious job that takes time and that not every tailor would agree to do. 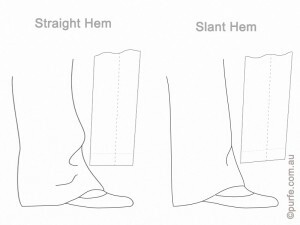 It might also cost more than regular hemming as well, but the benefits you’ll get out of correctly hemmed flared pants are definitely worth it. A point to be mentioned as well is that skinnies are not very captious of heels. The flared pants, on other hand, certainly are. And as long line created by flared pants is immeasurably complementing to almost every body type it is worth to scrutinize every cm of pants length and heel highs to get most of them. That’s true even if this involves extra spending on tailoring or getting a second pair to be hemmed at different length. The topic of right pants length came up while I was choosing pants for Christmas party outfit for my friend. She suggested to make a handy tutorial about this. Being a pants person for some part of my life I definitely accumulated a bit of knowledge on the topic. It did, however, seemed too obvious to write about. Can’t we all tell how pants should fit? I parked idea on a side while one Friday night in the City I started to pay attention for girls in pants. Huge crowd of women swept past me wearing jeans, flared, cropped pants, skinnies of various colours and styles. Surprisingly, however, I could count those fitting well with the fingers of one hand. And that’s only taking into account the length, not even the style or fit. I was dazed. The need of a good article explaining the concept was obvious. What is the Right Length for Skinnies? 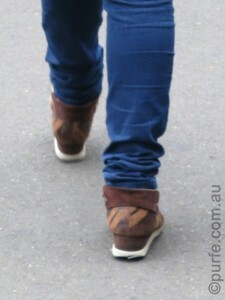 I could count 3 ways women wear skinny jeans: tucked, scrunched around the ankle and cuffed. And, actually, there is one more. I do remember seeing a desperate attempt to make skinny jeans reach the middle of 11 cm heels. That was giving an impression of having hoofs. Quite unusual sight. The version when pants stop at ankle is so rare that I didn’t even count it as “way to wear”. Meanwhile, it is the only right way to wear non-cropped skinny pants. They should hit at the ankle. No trade-offs. And yes, after some hunting, I’ve spotted one with correct length. They could be about 1 cm longer for heels then those worn with flats, but no more than that. 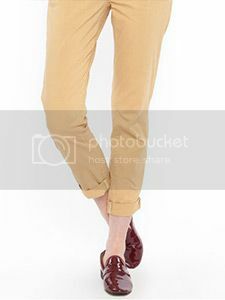 Most tapered pants are also obeying “ankle length” rule. Well, it depends. I’ve seen very nice look with skinnies slightly scrunched at ankle. The main word is slightly. The other important detail is wearer’s figure, build. It was a quite a lean young girl with narrow hips and long legs. In other cases scrunching tends to break up a silhouette line and makes figure appear stumpy. Long skinnies have great potential for shortening. Excess of length can be easily fixed, but its lack is a tricky thing to deal with. It is one of the major sartorial crimes to cuff skinny jeans and pants to an ankle length. Shortened in that manner pants cry out loud they are not fitted properly (or trend is too original for me to appreciate). The only way to cuff skinnies is to roll them above the ankle to resemble cropped pants. Of course, made in such way cuffs should not bulge out with all its multilayered fabric glory. Colour is another characteristic to think about. I’ve noticed that cuffs look best on light coloured pants where the difference between right and wrong sides of the fabric is not well defined so contrasting cuff does not break off the leg line. Now, before taking a pair of skinnies to the tailor let me mention couple of handy points. Shrinkage. Any pants (especially denim and linen) should always be washed a few times before tailoring as they may shrink lengthwise. And then, few times more. And even then, many will still shrink up over the time. So it might pay to wait while fabric is settled. Tapering. 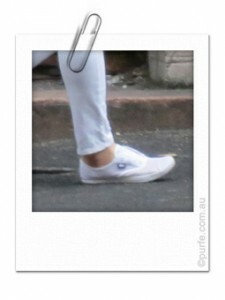 Initially skinnies are made to be tight enough at the ankle. However, shortening can make them wider around the edge. 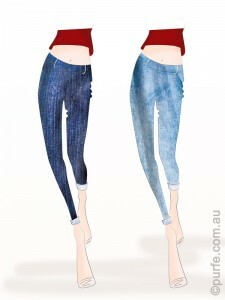 So the hem of the pants which is designed to be the narrowest and sexiest part of the jeans may start to jiggle around. Even an extra 2 cm of excess fabric may be enough to throw the whole look out of balance. So check it twice and ask your tailor if something could be done to slim the ankle if necessary. Some pants shown in this article are available from The Iconic store at the time of publishing. Right Pants Length: Flared, Bell-bottom, Wide Leg Pants.